Borussia Dortmund maintained a four-point lead at the top of the Bundesliga – and stretched their advantage over fifth-placed Bayern Munich to seven – with this dramatic comeback at the Westfalenstadion. It had all looked so good for the defending champions when Robert Lewandowski soared to head home against his former club in a first half Bayern had dominated, but the tide turned in an eventful second half. Dortmund captain Marco Reus equalised from the penalty spot after he himself had been brought down by Manuel Neuer. Lewandowski got his second after a superb Bayern move down the right, but Reus levelled the scores with a superb second of his own before Dortmund substitute Paco Alcacer struck what turned out to be the winner just moments later. 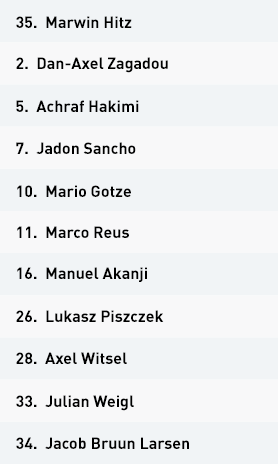 Borussia Dortmund set up in a 4-4-1-1 formation, with Marco Reus and Mario Gotze operating ahead of a midfield that featured English youngster Jadon Sancho on the right. It was Reus who beat Bayern centre-back Mats Hummels to a loose ball and surged on goal for the first chance of the match, but his low effort was comfortably saved by Manuel Neuer. Dortmund’s early progress continued from transitions, as Bayern Munich’s lack of left-sided cover was exposed. Pushing left-back David Alaba high with Frank Ribery created the space for Sancho to exploit on the break. Ribery’s impressive recovery runs halted the young winger’s early progress, but that couldn’t realistically last the full 90 minutes. The hosts mustered a few more counter-attacks in the first half, but from Bayern mistakes rather than incisive Dortmund pressing or attacking. It took until the 30-minute mark for them to sustain spells with the ball, as Bayern’s front line narrowed and blocked off access into the double pivot of Julian Weigl and Axel Witsel. The latter eventually dropped out of the midfield and into the back line, which enabled both Dortmund full-backs to move higher. Despite them now being able to play around Bayern’s narrow block, the hosts created little from wide areas in this phase. 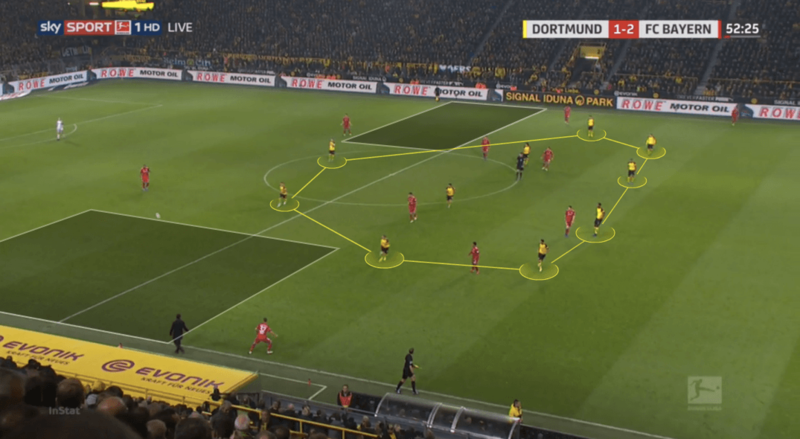 More disguised forward passes from their splitting centre backs would have added central penetration, as Bayern began to shift across even before Dortmund had fully switched the play. 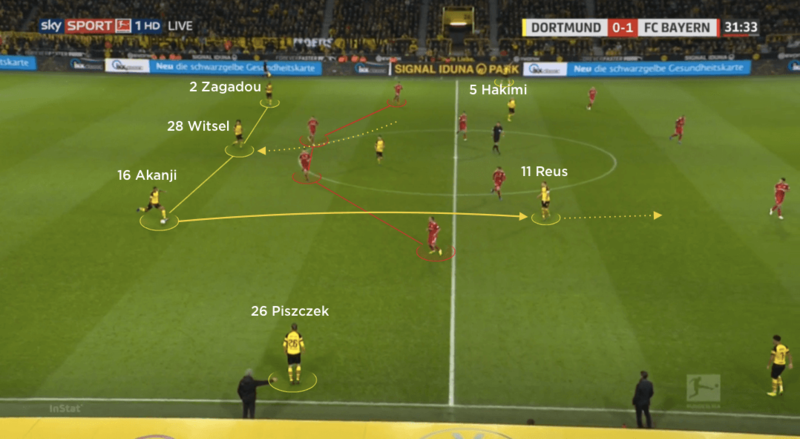 If the back line had opened up to play wide, but then cut the ball back into the centre, Gotze and Reus in particular could have received in dangerous spaces around Bayern’s double pivot, creating central penetrations against a back line that was dominant in the air. Weigl was withdrawn at half-time, to be replaced by Mahmoud Dahoud, and Dortmund soon found themselves level as Reus converted a penalty he himself had won after being felled by Neuer. 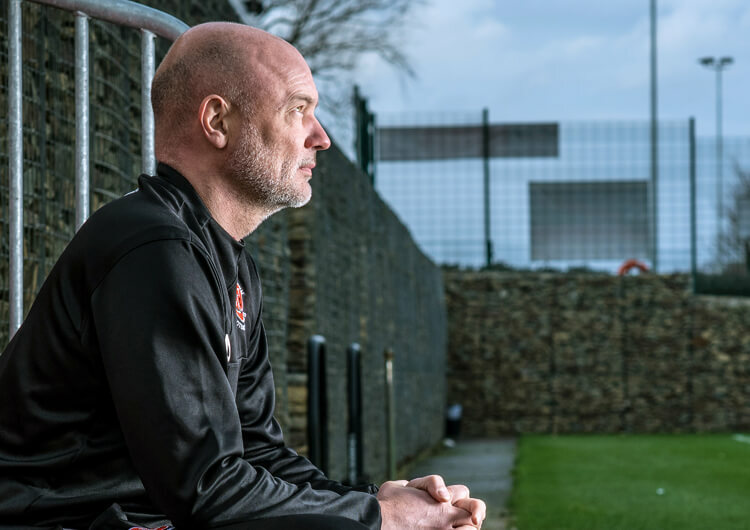 Sancho, who had played his captain in, continued to impress with his dribbling down the right, while Witsel altered his dropping movements to move along the sides of the back line rather than in between his centre-backs. This opened up a diagonal forward pass into Reus and Gotze, who were now enjoying more space between Bayern’s lines. Despite falling behind again, Dortmund still posed a threat on the break. Sancho demonstrated his devastating speed and directness when robbing Hummels and passing for Alcacer to somehow miss from close range before Reus struck again – this time with a glorious half-volley from a Lukasz Piszczek cross. The comeback was complete six minutes later, as Witsel carved Bayern open on the break to play Alcacer in to chip over Neuer. Out of possession, Dortmund sat in a mid-block and looked to draw the visitors forward, thus creating the space to hit after a regain. Their narrow structure ensured limited central space for the visitors, as Bayern focused on build-up play within wide areas. Dortmund’s 4-4-1-1 structure saw Reus step higher to support Gotze, as Sancho and Jacob Larsen dropped deeper into a flat midfield four. With both Sancho and Larsen dragged inside, the hosts were in prime position to counter-attack from the inside channels. However, this left the Dortmund full-backs to defend one-on-one against the likes of Ribery and Serge Gnabry. Despite creating a deep block to cover central access, the hosts failed to deal with Bayern’s wide play and fell behind to a cross headed powerfully home by Robert Lewandowski. They were again exposed wide on the right when falling behind for the second time in the game, Lewandowski again the scorer after superb combination play including Gnabry and right-back Joshua Kimmich. 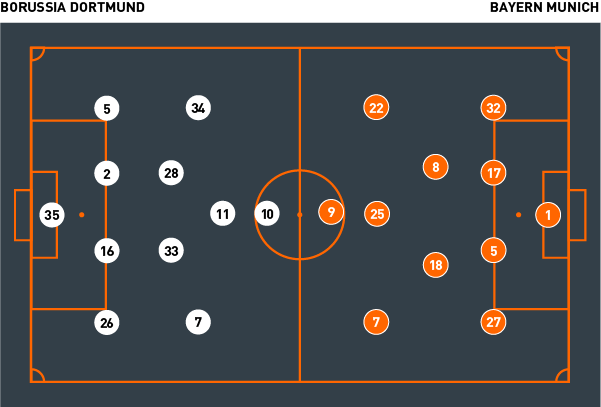 Dortmund regained their compactness and subsequently maintained a deep block. This worked to draw Bayern on to them, and leave the visitors exposed to the rapid transitions forward that ultimately saw the hosts claim a dramatic victory. In possession, Axel Witsel dropped into the back line from midfield. 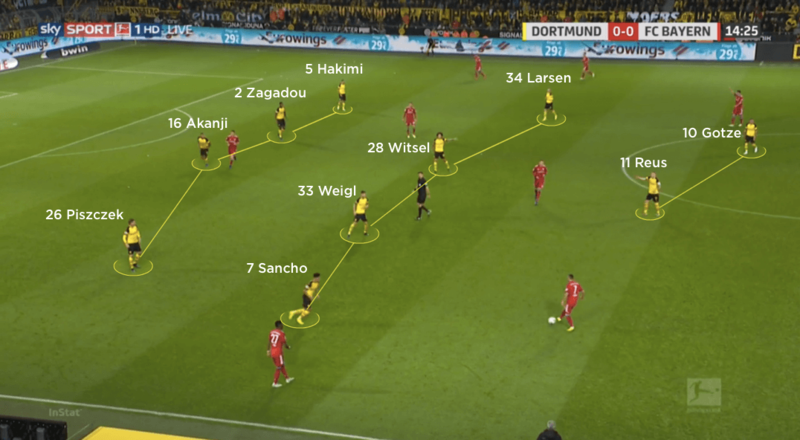 This pushed both Dortmund full-backs higher, avoiding Bayern’s congested middle – although better disguised passing from the back line could have helped the hosts penetrate centrally. The hosts dropped into a compact 4-4-1-1 out of possession, with Jadon Sancho and Jacob Larsen moving back into a flat midfield four. Marco Reus stepped higher to support Mario Gotze during transitions. As Dortmund remained compact and narrow in the second half, Bayern’s full-backs surged forward. From here, the hosts targeted the spaces in behind them on the transition. Inside movements from Bayern’s full-backs allowed Franck Ribery and Serge Gnabry to attack Dortmund’s isolated full-backs, who were dragged away from their closest central defender. After taking a deserved lead, Bayern sat off for the final part of the first half. They dropped into a narrow 4-4-2, as Thomas Muller stepped higher to partner Robert Lewandowski. Both Bayern full-backs moved extremely high in the second half, even after they retook the lead. This provided the space into which Dortmund could counter-attack through the speed of Jadon Sancho and co. Setting up in a 4-2-3-1, Bayern dominated the early possession. David Alaba and Franck Ribery both operated wide on the left, rather than one of the pair moving inside. This created a larger space between Dortmund right-back Lukasz Piszczek and right centre-back Manuel Akanji; from here, Robert Lewandowski could drop into the inside channel and link well with both Thomas Muller and the closer of the two midfield pivots, Leon Goretzka. Bayern looked to vary their attacks, with Muller providing direct runs in behind and looking to latch on to long balls from deep. This provided space for Lewandowski to drop away and get on to any loose balls behind Dortmund’s midfield, should Muller lose out on the first contact. Targeted and aggressive tackles on Lewandowski from the hosts’ back line ensured the Polish striker grew frustrated against his former club – at least until he put his team ahead with a close-range header from a Serge Gnabry cross. Inside movements from both full-backs – Alaba and Joshua Kimmich – served to drag Dortmund’s wide midfielders inside. From here, Gnabry and Ribery provided the width, pulling Dortmund’s full-backs away from the safety of their back line. This left Muller and Lewandowski to occupy a centre-back each, with the latter taking full advantage. 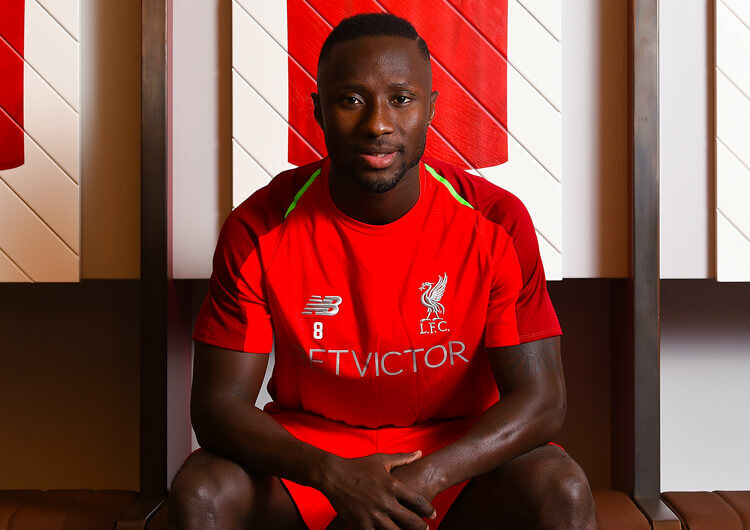 He struck again a matter of minutes after Dortmund had equalised, nodding home after a superb flowing move of combinations and right-sided rotations featuring Muller, Kimmich and Gnabry. Bayern showed no sign of reducing their attacking intent, as both full-backs continued to push higher – but despite their inventive forward play, their high line became a target. As Dortmund equalised and then went ahead, Niko Kovac threw on Sandro Wagner for Muller – but not even Lewandowski could turn the tide, as his second disallowed goal of the game signalled defeat for the champions. The visitors’ issues stemmed as they lost the ball, with their immediate covering of spaces too inconsistent. Neither Javi Martinez nor Goretzka dropped into Bayern’s back line from their double pivot, which would have created a temporary back three. Dropping in between the centre-backs, or moving down the sides, would have enabled quicker pressure on the ball to halt Dortmund’s forward progress behind Bayern’s full-backs. 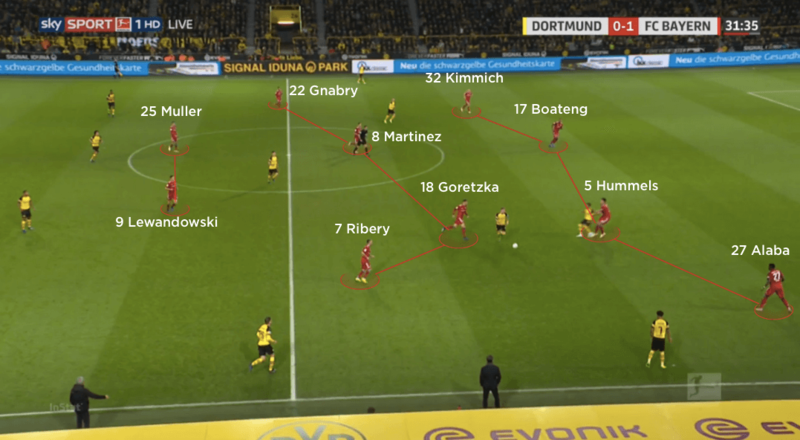 Whenever the hosts managed to sustain possession, Ribery and Gnabry would narrow and block off Dortmund’s access into their own double pivot. From here, Bayern encouraged the home side to build in the wide areas, knowing they would have aerial dominance from crosses in open play. This compact 4-4-2 mid-block worked well in the first half, but the visitors’ defensive comfort ended when Neuer conceded a penalty within the opening minutes of the second half. With Bayern continuing to push numbers forward, Dortmund targeted the high line of centre-backs Mats Hummels and Jerome Boateng on the break – particularly through Sancho’s remorseless pace on the right. Bayern eventually replaced Hummels with Niklas Sule, but they were continuously hammered on the break and eventually made to pay.